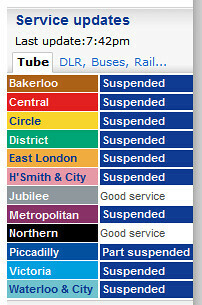 During the few months I’ve been living in London, there have been at least two potentially catastrophic tube strikes called off. So when I see the BBC reporting that the RMT are planning yet another one, I can’t help but feel like I’m justified in suffering from strike-threat fatigue. I don’t even get what the fuss is about, to be honest. Given that “TfL said it had assured the RMT that no staff would lose jobs or pensions, nor would any be transferred”, the fact that “the RMT wants a guarantee that Metronet workers will be allowed to join the TfL pension scheme and receive the same travel facilities as other TfL employees” seems like a pretty poor reason to try and bring an entire city to a standstill. But don’t get me wrong, I’m a massive fan of unionisation and what it’s given this country, and others. Actually, here’s a fantastic example from South Africa from this very week. Despite the fact that Zimbabwe has bought some arms from China – and that South Africa’s National Conventional Arms Control Committee has approved the transit of the weapons through the country – the members of the SATAWU union are refusing to unload the arms from the cargo ships because they disagree with their government’s lack of action on the issue.